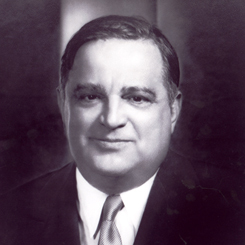 Image courtesy of Library of Congress A four-term Member of the House, Fiorello La Guardia of New York served as an impeachment manager for the case of Judge Harold Louderback. On this date, managers in the House of Representatives filed an amendment to one of five articles of impeachment adopted against Judge Harold Louderback of the U.S. District Court for Northern California. Louderback requested the amendment because his lawyers took issue with the article’s original language. Appointed to the federal bench in 1928, Louderback became the subject of a congressional investigation during the 72nd Congress (1931–1933) when allegations arose that he had given several friends positions as bankruptcy receivers, set their compensation, and then received a portion of their fees. The House Judiciary subcommittee formed to investigate the charges consisted of five Members: Judiciary Chairman Hatton Sumners of Texas; Representative Fiorello La Guardia of New York; Gordon Browning of Tennessee; Thomas McKeown of Oklahoma; and Leonidas Dyer of Missouri. After reviewing the subcommittee’s findings, the Judiciary Committee voted 10 to 5 on February 6, 1933, to censure Louderback. However, the subcommittee members all backed a minority report that recommended impeachment. In a rare move, the Judiciary Committee agreed to give the minority report a vote in the full House. After two hours of debate on February 24, the House voted to impeach Louderback, 183 to 142. “I declare to you, men of the American House of Representatives,” Sumners affirmed minutes before the vote was cast, “the only way you can make the people respect the Federal judiciary is to keep the Federal judiciary respectable.” The Senate delayed Louderback’s trial because the end of the Congress on March 3 left little time to conduct the proceedings. On May 24, following a two-week-long trial, Senators in the 73rd Congress (1933–1935), believing Louderback’s actions had not met the constitutional threshold of “high crimes and misdemeanors” necessary for impeachment, acquitted him of all charges.